MEC-Fairfax is a business incubator program designed to help start-up businesses grow and achieve maximum success. 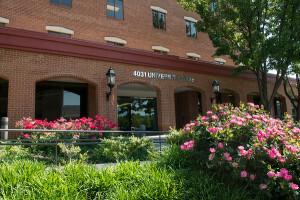 Located in Old Town Fairfax, MEC-Fairfax provides furnished office space, telephone and receptionist service, but unlike typical executive suites, we also offer access to business advisors, networking opportunities, and all of the quality educational programs offered at the Mason Enterprise Center. As a partnership initiative between George Mason University and the City of Fairfax Economic Development Authority (EDA), MEC-Fairfax is the largest, university-based business incubator in the Commonwealth of Virginia, featuring over 78 office spaces and approximately 30,000 square feet. In addition, it is home to Mason’s International Business Accelerator-one of only three in the country. This USA Business Now service assists foreign businesses in establishing a U.S. subsidiary at the Center in order to introduce their products and services to the U.S. market. At MEC-Fairfax, our resident entrepreneurs receive essential business support services. We are one of the family of programs hosted by the Mason Enterprise Center, which means we are co-located with other Mason programs such as the Small Business Development Center (SBDC), the Procurement Technical Assistance Program (PTAP), and the Mentor-Protégé Program (MPP). As a client of MEC-Fairfax, you’ll have easy access, at no additional cost, to the business counselors in these programs. MEC-Fairfax also provides vital referrals to service providers in the “Friends of Mason Enterprise Center” professional network-trusted experts who can help your business grow. Your affiliation with George Mason University means you’ll have access to faculty and students at Virginia’s largest public university. In more than a decade of operation, MEC-Fairfax has helped dozens of companies grow and achieve success. We provide invaluable assistance by setting and monitoring mutually agreed-upon milestones, tracking your financial results, analyzing any shortcomings, and providing recommendations for improvement. Upon achievement of milestones, your firm will graduate from the program within a maximum period of 24 months. Notably, 80% of our clients are able to reach or exceed their goals, and are still in business five years after graduation. Schedule a tour to learn more about the center and the services.